Center-stage is a series of articles spotlighting a particular model or unit in Godslayer. In this article we look at the last of the starter-box units the Fjell Warriors of the Nordgaard. Nordgaard is a land guarded by two immense mountain ranges, between which lie misty highlands and craggy hills, covered by a blanket of heath-land and pine woods. Hundreds of Dwarven villages are scattered across this landscape, most of which survive primarily from agriculture. During Ice-Season the region is prone to annual sea-borne invasion over the ice-sheets as well as constant raiding by Troglodytes, Banebrood, and other enemies. Local monsters and natural beasts of the wilderness also pose a constant threat, so every village must maintain a militia to survive. These consist primarily of Fjell Warriors, and during times of war, they make up the bulk of Nordgaard’s army. Many of Nordgaard’s enemies have underestimated these militias and died because of it, for despite their mediocre fighting skills Fjell Warriors are well equipped with helmets and chainmail of steel and their powerful muscles wield heavy axes. Fjell Warriors typically fight in a shield-wall formation where each warrior locks his shield together to provide a consistent barrier. This tactic is especially useful for Dwarves for they lack mobility. Excellent armour, natural toughness and high morale provide the Fjell Warriors with tremendous staying power; and charges that would sweep away the militias of other races are rudely blunted upon the steel fortitude of a regiment of Fjell Warriors. 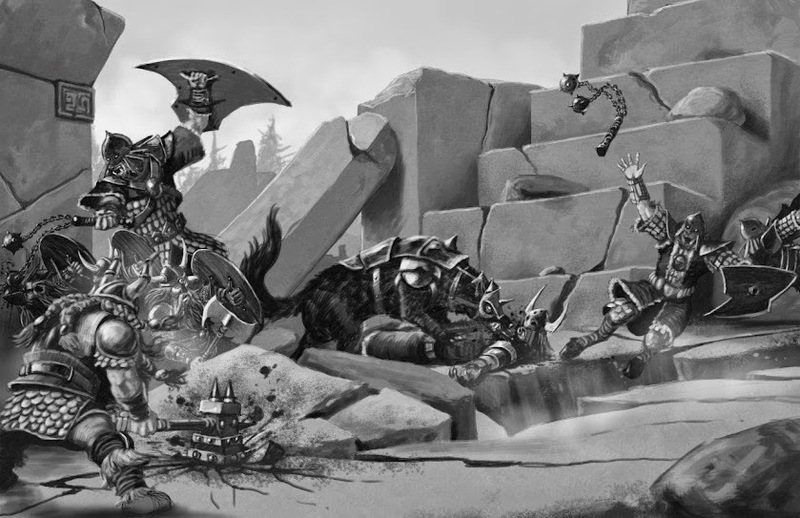 Once the enemy has charged and become stuck upon the anvil of the shield-wall, the hammer comes crashing down in the form of Fjellgangrs and Chainslayers. It is not uncommon during peace-time for Fjell Warriors from Nordgaard and the South-holds to join warbands of adventurers in order to supplement their regular income with plunder from the nations of central Ghorn. With axe and shield in hand these doughty warriors storm down the mountainsides like an avalanche, falling upon the enemies surrounding their highland realms. Okay so first of all when we check their card we see that they belong to the Clans sub-faction and are standard infantry (with an exhaustion limit of 4). With a DPL of 4 you can have up to four units of Fjell Warriors in warbands up to 500 points, with up to 8 models in each (which would cost you 336 points when maxed out). MOV 2 – Hmm that’s bad; few models are this slow, but what do you expect from Dwarves. MIS 4 – Basically untrained in missile attacks. DEF 12 – Below average. Without their shields, they have a basic DEF of 11. This indicates they are not professional soldiers and shows their racial disadvantage of being bulky and short, resulting in a lack of maneuverability (especially considering the weight of their armor). LEAD 9 – Well above average for regular units; these guys have tremendous willpower. ACT 4 – Standard for normal troops. Not bad for a basic militia unit – clearly they are slow, well-armored and short on defensive skills but possess great morale and discipline. Kind of like the classic Dwarf so far. Let’s dig a little deeper. Shield – Their round shield provides them 1 point of DEF and 1 point of ARM (already calculated into their stats). The most important thing about the shield is the fact that it enables them to use the tactic Shield Wall. Axe – Range-1 and POW4 is an average weapon in Godslayer. That is not to say the most common since many, many models have POW3, but in terms of the scale of weapons from dagger (POW1) to mighty warhammer (POW8), this is somewhere in the middle. Actually POW4 is better than a lot of other models. Compare them to Hoplites, Legionnaires, Bladeslingers, Reaver Runts, etc. Shield Wall – Each warrior overlaps his shield with that of the comrade to his right, providing double protection and a coherent defensive formation. The Fjell Warriors gain +1 DEF and +1 ARM but cannot charge or use a fighting style, and cannot use the tactic after charging. +1 DEF and +1 ARM is nice. Losing the fighting style is not nice. Of course they need to be in base contact with one other model. Compare Shield Wall with the Halodynes’ Phalanx; Hoplites gain +2 ARM and suffer the same restrictions, so actually Shield Wall is quite equal with the Hoplites’ Phalanx, however, there is one major difference – Hoplites must pay one ACT for their tactic, while Fjell Warriors can use Shield Wall for free! Now this difference may not sound significant, but it means that Fjell Warriors can use their tactic and make two attack per round without the necessity of receiving an assigned action token from the Warlord. This makes their warband much less reliant on the warlord and more flexible. And another point; Hoplites need to be in base-contact with two comrades to benefit from the tactic, while Fjell Warriors only require contact with one of their fellows. This makes the Shield Wall harder to break than the Phalanx. Skilled Strike – Regular melee training enables the Fjell Warriors to perform more advanced combat moves at times. From this they gain +1 MEL until the end of the current round. So in practical terms when they are not fighting defensively (inshield Wall), the Fjell Warriors have an effective MEL of 6. Now things are looking up. 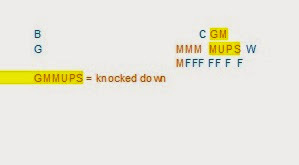 Knockdown is even more common such as with the Banebrood’s Black Plague, Hammerfist’s Tactic Rumble, Ironhide BrutesCritical Knockdown, Warsmith’s Chasm Cracker, Fleshpounder’s Beatdown, Bloodvarg’s Pounce, and the Lord of Decay’sMass Grave. Lifepoints – Another point to note is their Lifepoints of 6 each, which is 1 point better than average Humans. Together with their good armor, this can enable them to go one more round in melee than other militia units. The following models work exceptionally well with Fjell Warriors. • Warsmith – The ultimate best-friend for your Fjell Warriors. The Warsmith is ideal for leading a melee warband composed largely of Fjell Warriors. He has two useful tactics to buff his troops: Embolden which gives a very useful +1 MOV for charges, enabling the Fjell Warriors to charge the same distance as regular human infantry (2X3+2). Without it they have a charge range of only 6 inches! Grindstone – This nice tactic provides your Fjell Warriors +1 POW, which compliments their own self tactic Skilled Strike (+1 MEL) very nicely. Also very handy is the fact that Fjell Warriors are not required to take LEAD tests for receiving these ordered tactics from the Warsmith because of his Fjell Commander ability. Shatter – Probably best of all is his tactic Shatter which affects enemies, reducing their ARM by 2 or decreasing their POW by 2. This tactic can be used both offensively to decrease enemy ARM when the Fjell Warriors attack or defensively to decrease enemy POW when the Fjell Warriors are being attacked. In most cases I would go with reducing the enemy POW, because when you combine this with the armor of the Fjell Warriors and their life-points, you make them rock-hard. Occasionally it is better to cause the -2 ARM, especially when the Fjell Warriors are facing enemies with great armor like Legionnaires, Hoplites, Carnifexors, Duskborn Chieftain, Centurion, Demarchon and Skulleaters etc. And in the lucky event that they do get to charge, it makes sense to improve their offensiveness by crippling the enemy with -2 ARM – effectively increasing the POW of the Fjell Warriors by +2. When you combine that with the tactic Grindstone, and charge bonus, then the Fjell Warriors have effectively POW8 on the charge! Remember you can use both tactics together because one is applied to the enemy and one applied to the Fjell Warriors, so this is a mega-combo not to be overlooked. Chasm Cracker – Another really useful tactic to knock down several enemies, preventing them from attacking, and effectively giving your Fjell Warriors +2 MEL, plus: the enemy cannot counter attack while on the ground and needs to pay an ACT to stand up!! So overall, the Warsmith is a fantastic support for the Fjell Warriors and because of this should not be thrown into melee where he will expend all his action tokens on attacks except to deal with some really tough guys; rather he should be kept in reserve to dish out tactics and assign action tokens to units. • Runegate Keeper – If you are designing a warband with lots of Fjell Warriors, then I would rather recommend the Warsmith to lead them (in order to benefit from the sub-faction ability), but if you are playing a Clans sub-faction warband, Fjell warriors make a great addition to give the warband bulk in the form of decent-quality but cheap troops. The Runegate Keeper also has some cool buffs for the Fjell Warriors. Fortify gives +1 ARM and prevents them suffering critical hits. Some models in Godslayer have nasty effects which apply when they score a critical hit in addition to the extra damage, and fortify also protects from these (for example the Sons of War’s Instant Kill, Halodyne Spell Holy Fire, Wyldfolk spell Fennellyn’s Fireblast, Ironhide Brutes Critical Knock Down, and Skewer of the Beasthunter and the Scorpio). His tactic Bedrock provides +1 DEF and prevents models being knocked down. Inspire allows a model unit to gain +1 ACT when he slays an enemy model. So the Runegate Keeper is also a decent leader who can buff your Fjell Warriors. • Brewer of Odrorir – A handy fellow to have around. His brews can buff your Fjell Warriors. Guarding Draft gives +1 DEF, and this is especially cool when combined with the Bedrock tactic of the Runegate Keeper to give the Fjell Warriors DEF14. In Shield Wall it is 15!! Strongarm Ale is great for when your Fjell Warriors are making attacks or charging, giving them +1 MEL & POW, but costing them -1 DEF. Also remember that these brews are a special talent, not tactics, so Fjell Warriors can use them in addition to their self tactics and ordered tactics from the warlords. • Blood Varg – An absolute must. I recommend to take as many as possible in a Dwarf-heavy Nordgaard warband since they will go a long way to neutralizing your main deficiency – stumpy legs. • Valkyrie – the Valkyrie can resurrect Fjell Warriors back to life and heal them too, but her talents are better spent doing this for higher-point models like Einherjer or Toughborns. So by all means take a Valkyrie for fun, however for beardy, tournament warbands only take her if there are expensive units on the board or if your strategy requires some fast support. With 16 inches potential movement per turn she can be very useful just for her speed and melee skills. 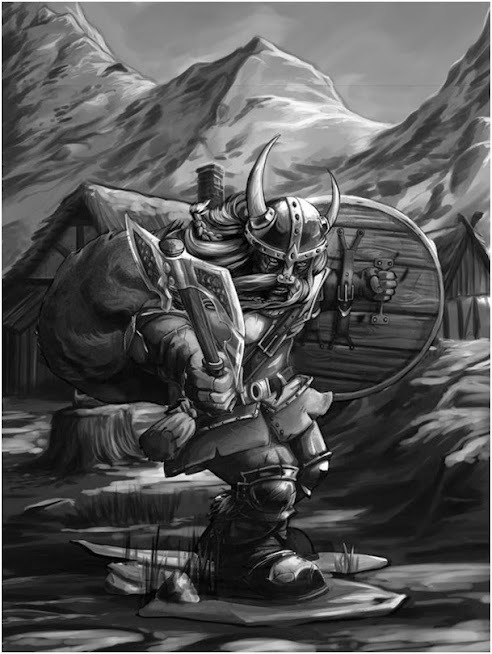 • Skannfyrd Kinswords – Can also be useful as a small unit of skirmishers; they compensate for the slow speed of your Dwarves. Movement – at this point we should discuss the Fjell Warriors’ movement issue because it has great relevance to all strategies involving them. When they move 4 times per round, they can cover a paltry 8 inches, and their normal charge range is a laughable 6 inches. Good luck with that! Okay it’s actually not as terrible as it sounds because Fjell Warriors are actually designed around receiving charges and surviving them, as you will see. It is entirely possible to construct successful strategies that do not depend on charging to gain for victory. You will find that after the main charges which often occur mid-game in open battles, the models and units of both warbands are now very close, and so a charge range of 6 inches (+1 inch MEL range) is sufficient in many cases. This is especially true if you keep your warband tight. And don’t forget the Warsmith’s tactic Embolden can increase it to 8 inches. What they can rarely accomplish in charging is the initial charges of the game; while charges are very often possible thereafter. This is the classic strategy of absorbing the enemy charge and then responding with heavy hitters. 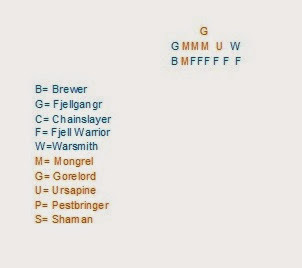 For this formula you will need one Warsmith equipped with Groundmeld potion, one or more large units of Fjell Warriors, one Brewer of Odrorir and one Fjellgangr as well as one Chainslayer. Optional: double up the warband with another unit of Fjell Warriors and another Fjellgangr and Chainslayer. Take full units of Fjell Warriors and place them in Shield Wall (+1 DEF and +1 ARM). Place them in single file and leave a small gap near one end of the line (remember, they only need to have base contact to one other model to benefit fromShield Wall). Behind the Fjell Warriors, between the gap and the end of the battle-line, place the Warsmith so he has line-of-sight through the gap to the most dangerous unit/model lining up to charge your Fjell Warriors. He needs to have LOS to the enemy (to use his Shatter tactic), but it is also good if he can be placed towards the end of the unit. This is important because he needs to have space to move into with his Groundmeld Potion next round. Place one Chainslayer in front of the battle-line with the tactic Whirlwind activated. In this way, some enemy models charging your Fjell Warriors will likely pass through the MEL range of the Chainslayer, and in so doing will suffer free-strikes. If your battle-line consists of two units of Fjell Warriors, then place on Chainslayer in front of each. Move up your heavy-hitters on the flanks (Fjellgangrs). Give the Fjell Warriors Guarding Draft from the Brewer and use Shatter from the Warsmith to reduce the POW of the most dangerous unit in charge range of the Fjell Warriors. In this way you effectively increase the ARM of the Fjell Warriors by +2 so they have the equivalent of DEF14 and ARM11. In the next round let the opponent have priority if you win, tempting him to make an unsupported charge during the first activation. If the opponent wins the priority and forces you to go first, and if you have less cards than him, you can pass and thereby force him to move/charge. In this case he will be able to activate a character/warlord and buff a unit then charge you. This is not ideal, but not disastrous. With a slow army consisting mostly of Dwarves, you will be charged often and this strategy takes that into account. After he finally charges your Fjell Warriors, but do not make your counter attacks. Now activate your Warsmith and use his Groundmeld Potion. Move him under the battle-line of the Fjell Warriors, placing him in base contact with the enemy models engaged with your Fjell Warriors. There should be now a nice, neat line of enemies. Now use the Warsmith’s Chasm Cracker tactic and you will probably knock down 3-4 enemy models. Now use the tactic Shatter on the enemy unit with highest armor that is nearby, causing them to suffer -2 ARM. (Alternatively to usingShatter, if there are lots more enemies lined up, you could also use Chasm Cracker a second time). Finally, order the tacticGrindstone (+1 POW) to your Fjell Warriors and assign them an action token. Now immediately activate your Fjell Warriors and perform the Skilled Strike tactic (+1 MEL), and chose Powerful fighting style. It is important to do this immediately in order to prevent your opponent activating his knocked-down models and standing them in the next round before you can attack them. Next you should execute the models in front of the battle-line which are knocked down. These guys suffer -2 DEF for being knocked down, so together with your Skilled Strike and Offensive fighting style bonus you will be attacking with +4 to hit. Because of Shatter, Grindstone and Powerful fighting style, you will be hitting many enemies with an effective POW of 7. Remember that the Warsmith gave them an extra action token. This will enable them to move once so that they can engage and kill other models after executing the closest ones. This combination should produce a massacre, even if you lost 2-3 Fjell Warriors. If you have 4-5 left, you can potentially make 8-10 attacks, most of which will be with +4 to hit and +3 POW. Against basic units you normally don’t need to buff them that much, but against heavy units you need every point of advantage. In your next turn, use Strongarm Ale (+1 MEL & +1 POW) on one of your Fjellganger and charge with him. This round should have swung the battle in your favor. Hopefully he charged your Fjell Warriors with his best troops. In that case you have now robbed the opponent of the impetus and his advantage of being the charger. Most units and models will now pile into this central engagement in a tight bunch where your Dwarves short charge distance and movement will not be such a disadvantage. 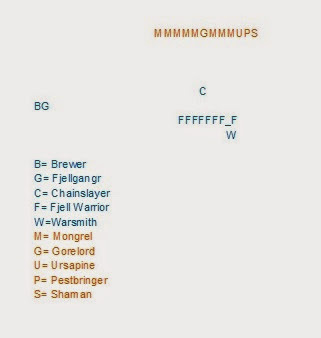 A variant: If you prepare your trap properly, you will have the equivalent of DEF14 and ARM11 Fjell Warriors against the unit charging you, and 6 Life-points for each Fjell Warrior. Against most enemies that is enough to ensure 4-6 of your Fjell Warriors survive, but let’s imagine they are charged by. A unit of buffed Guthackers and a Gorelord. In that case they might be seriously smashed even with all the defensive buffs. In this case it is better to make counter-attacks against each of the enemy unit’s attacks instead of waiting to attack after the Warsmith has knocked them down. This is rather like the Hammer & Anvil but includes a unit of Fimbul Toughborns. Take a unit of 6 Toughborns and use them to harry the enemy as they approach. Focus them on units and characters with low ARM and try to persistently hammer those guys until they are dead rather than choosing different targets each round. As the enemy crosses the table, chose where you will make your stand and deploy your traps (from the Toughborns) in front of the battle-line. Try to anchor one flank against a building or rocks to protect that flank. Next round, place your Fjell Warriors behind the traps, in a line. The line should consist of 2 Fjell Warriors, then a one-inch gap, then two Fjell Warriors then a one-inch gap etc. Placing the Fjell Warriors in couples allows them all to benefit fromShield Wall. Now perform that tactic. Place your heavy-hitters on the exposed flank and slightly behind. The “Moving Wall” is for a Dwarven warband facing a faster and/or shooty opposing warband. With this strategy you move relentlessly towards the enemy, even if they withdraw, and keep going, employing shield wall all the time. In each round, move towards the enemy (or scenario objective) four times and then go into Shield Wall. When the enemy is close, they will probably be able to charge you before you can charge them. A) If the enemy is within charge distance (8 inches +1 inch MEL RNG), then buff the Fjell Warriors with an action token from the Warsmith as well as the tactic Embolden. Now charge with the Fjell Warriors. B) Perhaps your warband is not led by a Warsmith and so you do not have the tactic Embolden to give your Dwarves a charge range of 8 inches. Or perhaps the Warsmith is busy or dead and cannot give the unit the tactic. In such cases you may not be able to charge the enemy (with your charge range of 6 inches), but perhaps the enemy is within engaging range (8 inches +1 inch MEL RNG). In this case they are likely to charge you. One good option open to you is to move forward 4 times and engage the enemy, then activate Shield Wall. Works best if the enemy unit has already finished its activation and has no ACT left. Nevertheless, it can also be used against units which have not activated. Although you will not be able to counter-attack the enemy when they make their attacks (because you spent all of your action tokens), you will have robbed them of their charge bonus and they will be facing your DEF13, ARM9 Fjell Warriors. If possible, place your Fjell Warriors so that only one or two are engaging the enemy (forcing the enemy to waste an ACT to move more troops into range before attacking you). Also, if you have the opportunity, engage other enemy models and units with the same unit of Fjell Warriors, preventing them from charging too. You should also try to put in place the other defensive buffs as in the “Hammer and Anvil” plan above (Hardneck Mead or Guarding Draft from the Brewer and Grindstone and Shatter from the Warsmith or Fortify or Bedrock from the Runegate Keeper). C) If the enemy is completely out of your engaging range but they can charge you, then activate Shield Wall, buff them with defensive tactics and prepare to be charged. Keep your heavy hitters close by to charge units which charge your Fjell Warriors. D) If the enemy still cannot charge you and you cannot charge them, then move forward and perform Shield Wall. Same as above – keep your heavy hitters close by. If you are chasing fast enemy and want to get into melee with them, then Shield Wall may not be really necessary. Light enemies such as Bladeslingers and Reaver Runts can be frustrating to face. Assign the Fjell Warriors one action token from the warlord, and order the tactic embolden to them, giving them a charge range of 8 inches. Then charge the enemy which is too far away. This will result in a failed charge and your activation will end, but you will have moved 8 inches towards the enemy and you still have 2 ACT left to make one counter attack assuming they charge you. Nordgaard does have fast models, for example the Bloodvarg and the Valkyrie so you do have the possibility to dictate play when you use them to support your Fjell Warriors. With the Valkyrie you need to wait until one of your models is killed before she arrives on the table, so it is best to take 1-2 Bloodvargs even if you also take a Valkyrie. Move your entire warband forward at the same pace. Ensure that your Warlord is activated early so he can assign action tokens to the fast models. When you get closer to the enemy, use the fast models to engage the enemy. Try to minimize how many models you engage. Both Bloodvarg and Valkyrie can manage 2 regular troops or one elite trooper / character at a time. In this way you limit how many counter attacks your Bloodvarg and Valkyrie will be receiving. Remember the Valkyrie has a MEL range of 2 inches, so take advantage of that by placing her 1.5 inches away from models with RNG 1 weapons. In this way you engage them and prevent them from charging but they cannot attack you. With the Bloodvarg try to engage only enemy units which have already activated or you can be killed in one round. Remember to use pounce to knock down enemies charged by the Bloodvarg. If possible, use only one attack on that model and try to leave him alive but knocked down, as this will prevent that unit from charging next round! The Valkyrie can also engage small units which have not yet activated. With 6 action tokens, you can move the Valkyrie and Bloodvarg 4 times (16 inches), and engage two models, then use the remaining 2 ACT for an attack to kill one of the enemies. In this same round that you engaged the enemy, move up your Fjell Warriors as far as possible. In the following round, enhance your Fjell Warriors with some of the offensive buffs discussed in previous plans above. Then charge them into the enemy. Fjell Warriors are an ideal addition to warbands of Clans and Skannfyrd sub-factions. Their low cost allows you to field a unit to use in a defensive capacity. Clans warbands are costly in points since troopers cost 16 points (Fimbul Toughborns) or 24 points (Einherjer) each. This results in very small warbands. Sometimes it’s good to bulk it out a little with some low-cost troops. • You direct the orchestra. If you start dancing to the opponent’s tune you will be lost because Dwarves just cannot keep up, so don’t go chasing after Bladslingers through forests – force the enemy to come to you. • Keep you warband compact so that the enemy will be forced to bunch-up. In this way you reduce the distances needed for your Fjell Warriors to engage and charge the enemy. • When facing warbands with lots of AOE attacks, keep your Fjell Warriors in pairs but with each pair widely spaced apart. This allows you to benefit from Shield wall while also limited the casualties. This is a great advantage Fjell Warriors have over Hoplites and Legionnaires. • Use your Musician for channeling ordered tactics to other Units in the warband. This is especially useful for Dwarven warlords so they dont waste all their ACT running around. Also Keep in mind the Fjell Warriors do not Need to test for receiving ordered tactics while the Musician is alive. Fjell Warriors are the quintessential Nordgaard Dwarves and we wanted to create with them a cheap, basic unit to represent the workhorse of the Nordgaard armies. Over the 4-year period of development it is remarkable that the original conception of the Fjell Warriors did not change at all. Actually for the first 3 years of test-gaming Godslayer we were using rules for arcs, whereby models had a front arc and a back arc. This however resulted in some stupid situations and unnecessary complexity, so in the end we removed them and streamlined the rules. So removing references to the “front arc” (for theShield wall), not one single thing was changed. The Fjell Warriors and the Hoplites were the two first units designed and tested, and they acted as a reference for developing many of the next units, so their continuity is therefore not surprising. At one point there was a discussion if Dwarves in general should have their movement changed to 2.5 inches, but in the end the true, veteran Dwarf players of the design team dug in their steel boots and refused to buckle, and so they were left with a MOV of 2. Fjell Warriors become very powerful troops with some easy buffs from the Warsmith and the Brewer. They make excellent blockers and they can last longer in melee than most other units of the same points-level. The key to using them is to compensate for their lack of speed. For 10 points each every Norgaard warband can afford a unit.